Is the IAmsterdam Card Worth the Trip? A polarization of beauty and sin, bicycle bells and flowing canals to windows filled with scantily clad women; it’s amazing this city functions so well. In fact, it seems to be exactly what we all should aspire to – adopting the idea of live and let live. No one seems to be scandalized by the tolerance of soft drugs and prostitution at all in Amsterdam. In fact, it makes the scenic areas of the city even more pleasing, as it shows how harmoniously sophistication and a little hedonistic fun can co-exist the same space. Amsterdam, the capital city of the Netherlands. I’m obsessed. With that said, at time this city can be a costly experience, from food and accommodation to luxurious activities and sightseeing. Many visitors opt for the IAmsterdam card offered for a flat rate that includes public transport, entrance to many attractions and a few fun discounts. I tried to use my 72-hour card to the fullest: so, was it worth the price? Hands down this was the best aspect of the card. Yes, you can buy GVB cards on the trams and at stations, but the convenience of having this sorted ahead of time was priceless. I did have to purchase a ticket to get from the airport to city center, but after that my IAmsterdam card was used everywhere. Not only did I use the easy-to navigate trams and metro often, it kept me from ordering Ubers and taxis so I could splash the transport budget elsewhere. The map included with the card came in handy there too, but signs are conveniently displayed and people are super friendly, happy to help if you look lost. Dutch cuisine isn’t known for its excellence or versatility, sadly. But I will say, they know how to make damn good cheese. The best aged cheese comes from the Reypenaer cheese shop, which boasts a little storefront marked by blue awnings. They ship their cheese all over the world and it comes in about a half-dozen varieties. To get the real deal, book a ticket for the one-hour cheese tasting in the basement of the shop. It’s an hour of fascinating information paired with that fun Dutch humor. If the owner is in a good mood, he might break out the whiskey and regal you with cheese-making stories over the past three decades. Tickets for a cheese tasting class paired with wine is only 16.50 euros, but you can get 25 percent off with your IAmsterdam card. Any fans of Van Gough’s brief burst of creative genius in the world should set aside a few hours at his museum. The artworks are vividly preserved and can be seen up close – because his brushstrokes are what brings life into these famous paintings. I was surprisingly very moved by walking through the timeline of Van Gogh’s life. Being able to know about his difficult existence, muses, places he lived and even read letters to his friends made the paintings come alive. To think if he had access to modern mental health care, how different his creative process or quality of life could be. He was only 37 when he took his life. Seeing Amsterdam by water is special. It’s amazing how these captain navigate long passenger boats through the narrow canals throughout the day. 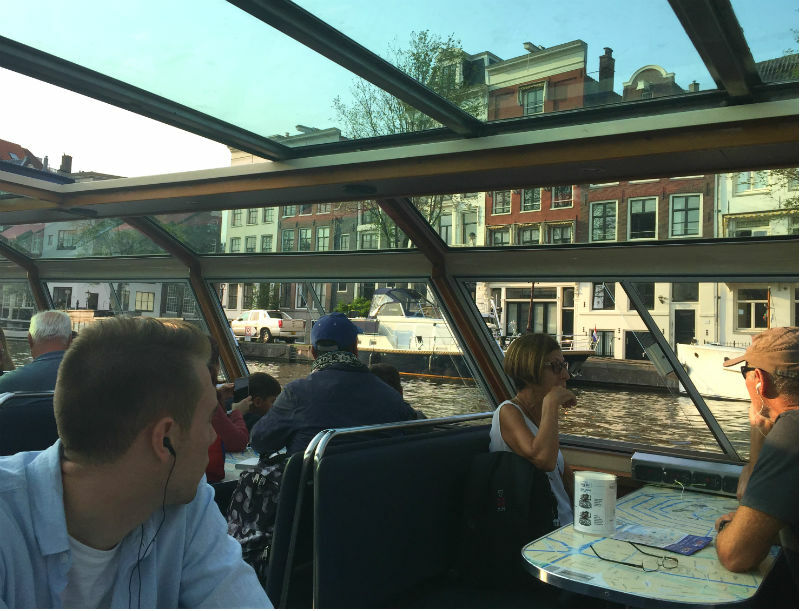 I loved the open windowed boat to you could take great photos and see everything clearly. The best part was moving out into the open waters past the canals to see new development in the city as the sun set. You can simply sit back and relax for the 90-minute ride. Or, plug in headphones to hear the audio commentary. This is included complimentary with the card. The only small difficulty was understanding which boat took the IAmsterdam card. After a couple attempts at the wrong dock, I finally managed to find the right boat and got my comped tickets in advance for the tour. There’s tons of boats in every color of the rainbow offering similar excursions. Make sure you’re with the right company. I was left clueless at the wrong dock for a while until I figured out where to go by calling the company direct. While waiting for the boat, I hopped into the city’s only real casino, as the card promised a five euro credit. What I didn’t understand is that the credit was not for the slot machines, but for the actual entry into the casino. I thought that a bit odd, especially during the day. Perhaps it’s more fun at night, but I’d pass on this one. There were a few discounts offered with the card to see a guided tour of the Red Light District. I took a little walk-through and saw the famous (infamous?) ladies gyrating in the small glass-window booths. I’d never judge and to each their own, but I’m not sure if I’d like to be in a tour group oogling the women from afar. I’d have to do more research to see if the tours actually benefited the women financially or were even run by them. Otherwise, a quick walk-through seems to be all you need to get an idea of what’s going on. There’s so much included in the pass that we only enjoyed a fraction of its perks. Next time, I’d like to take a peek in the Nemo Science Museum, which we passed on the canal cruise. It’s pretty turquoise façade is alluring and the exhibits plentiful. I also would have liked to check out the Heineken Experience brewery tour, especially as I rank more of this local brand of brew than I ever have before while in Amsterdam! Looking for a strictly foodie experience? Check out this guide for a great eating tour option in Amsterdam! Thanks to the Amsterdam Tourism Board and the Generator Hostel for being awesome hosts. Have you been to Amsterdam before? Did you visit for the scenery or the ‘extracurricular’ activities? What a lovely post, thank you for sharing your experience with us 🙂 I love the pictures on your blog! I’m planning a trip for Amsterdam next August so this was a very informative post for me. Thank you for sharing! I’m Dutch, but I didn’t even know this card existed! I’ll certainly check it out if we go to Amsterdam on a weekend trip! When I last visited Amsterdam I did not buy the IAmsterdam card, but I regretted it afterwards. Will definitely get it next time I am there! t really is worth the investment to see a little of everything!